Garden Ornaments. Built of reclaimed timber from the surrounding area, natural wood and clean-lined Finnish design create beautiful, practical items for your home. Handmade Lapland hats. Adorable and practical, these embroidered and appliqued traditional Lapp hats for men and women protect ears and faces and come in a wild assortment of colours. Hand-woven Rag Rugs. 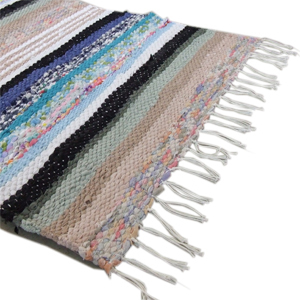 A mainstay of any Northwestern Ontario camp or cottage, rag rugs wash beautifully and add warmth and personality to any room. Woven from recycled fabric by local Finnish ladies, the rug rack boasts a variety of colours and sizes.